Harvest River Bridge installation. Photo by Jessica Mink. On June 30, the “Harvest River Bridge”, designed to join the Mattapan portion of the Neponset Greenway to the Milton side, was installed over the Neponset River, although it won’t be open pedestrians and bicyclists for a few more months. This is the second of two bridges recently added to the Greenway, the first being the canopy walk bridge over the Mattapan trolley. The bridge marks a major milestone in the Neponset River Greenway trail which will soon provide a recreational continuous corridor from Fowl Meadow to Boston, and allow the public to enjoy the Neponset as never before. Overall construction is expected to be complete in October of this year. The Neponset Greenway is currently attracting more than 10,000 users a day, and is expected to surge to 24,000 a day once the bridge is complete. For a map of the entire route and links to more detailed documents visit the Neponset River Corridor website. 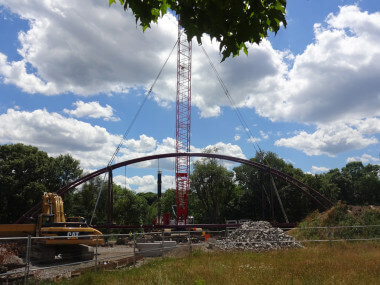 Click here to view photos of the bridge installation. Watch aerial video below of bridge installation. By Juan Navarro of Boston Aerials. The Neponset Greenway improvements have been made possible by more than three decades worth of work by current and former legislators, many extraordinarily dedicated community activists, committed state staff, the Department of Conservation and Recreation, and the Boston Natural Areas Network, with ample encouragement along the way from the Watershed Association. The result has been a transformation of the land along the Neponset River from a fenced off industrial wasteland into a thriving urban parks corridor. Read more news coverage at the Dorchester Reporter. I thought there would be some interesting information presented concerning the bridge and its construction, instead there was 5 minutes of jarring guitar.